I’ve said before that butternut squash and I were not always such good friends. 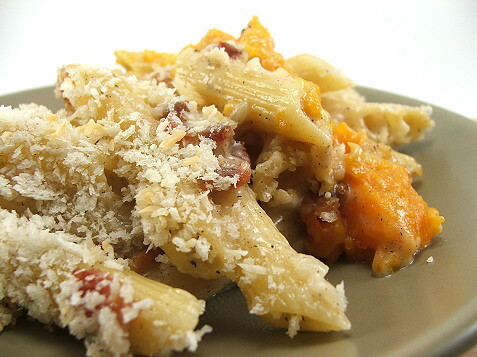 Once I discovered that I did not hate butternut squash – I liked it quite a lot in fact – I began to try new recipes so that I could add this tasty squash into my Fall recipe rotation. This recipe was one that I was positive would fail. I was so sure, in fact, I had dug through the junk drawer to find a pizza coupon. Boy was I wrong! 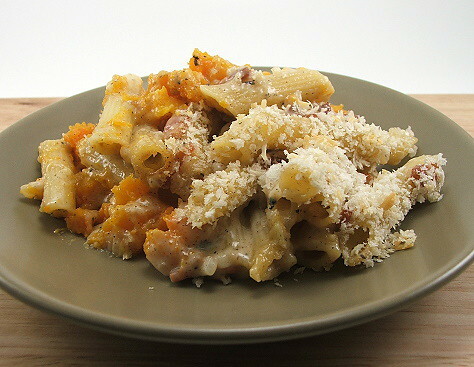 The sweetness of the squash and the salty cheese sauce, with a hint of bacon, was perfect! I went back for seconds. Oh, and I threw away the pizza coupon. Heat the oven to 375F and spray a baking sheet with non-stick spray. 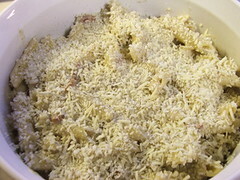 Also prepare a medium size casserole dish with non-stick spray. 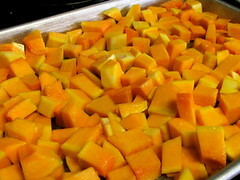 Place the diced squash on the prepared baking sheet and roast for 45 to 55 minutes, until very tender. Remove from the oven and set aside. 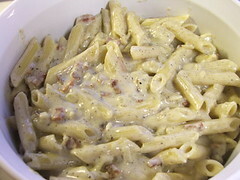 Prepare the pasta according to the package directions but reduce the cooking time by one minute. Drain and set aside. In a saucepan over medium heat cook the chopped bacon until very crisp. 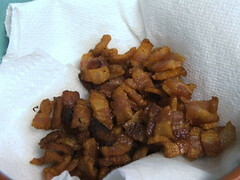 Remove the bacon from the pan and set aside to drain. 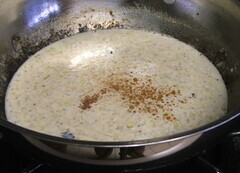 Remove all but about two tablespoons of the rendered bacon fat. 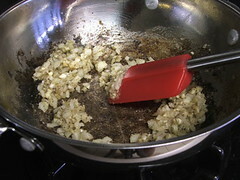 Add the onion and garlic and cook for thirty seconds before adding the flour. Cook the flour for one minute then slowly add the milk, whisking constantly. Add the cinnamon, nutmeg and season with salt and pepper. 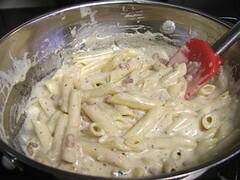 Cook until the sauce begins to bubble and starts to thicken slightly. Turn off the heat. 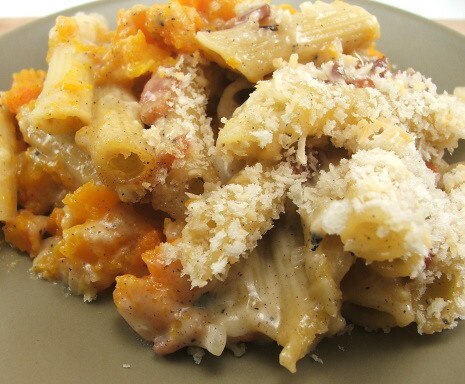 Add the shredded cheese to the sauce in three installments, making sure the first installment is completely melted before adding the next. 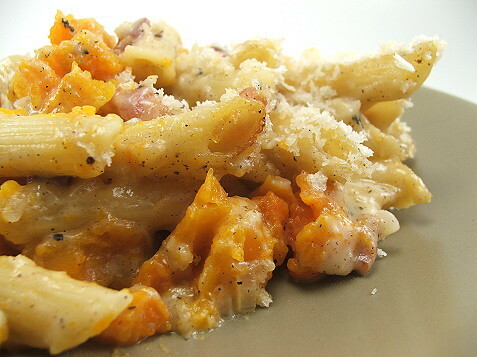 Fold in the cooked pasta. 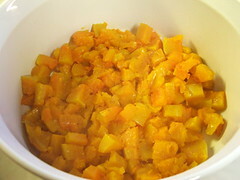 Layer the butternut squash on the bottom of the prepared casserole dish. On top of that add the pasta mixture. Top with the panko and parmesan cheese. 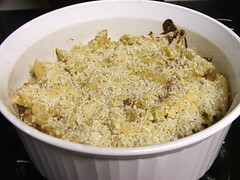 Bake for 20 to 25 minutes, or until the past bubbles at the edges and the cheese and panko are starting to brown. Cool for five minutes before serving.